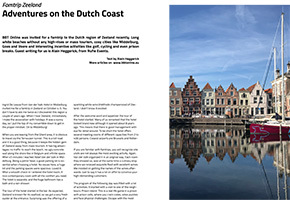 Ovation Global DMC’s and BBT Online’s most prolific guest writer Hugo Slimbrouck had himself another trip last month. This time he visited Georgia. Not the US state Ray Charles wrote that wonderful song about, but the Eurasian country that last hit the headlines when the Russian army invaded it a couple of years ago. Turns out it’s a very interesting and unexplored destination, with a fascinating capital. 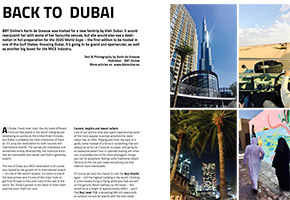 BBT Online’s Karin de Graauw joined another famtrip to Dubai. It reacquainted her with some of her favourite venues and activities in the Emirates, which is always nice, but she would also visit a destination infull preparation for the 2020 World Expo – the first edition to be hosted in one of the Gulf States. Knowing Dubai and seeing the preparations, it’s going to be quite a spectacular event. As well as another big boost for the MICE industry of course. 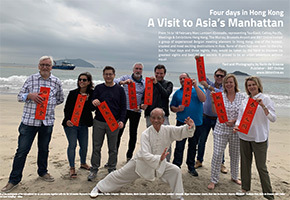 From 14 (yes, departure on St. Valentine’s day) to 18 February, Qvovadis, Toureast, Cathay Pacific, Brussels Airport, Meetings & Exhibitions Hong Kong together with BBT Online invited a group of Belgian MICE planners to Hong Kong: one of the busiest, craziest and most exciting destinations in Asia. For 4 days, they would be taken by the hand to discover the city’s greatest sights and best hidden secrets. It proved to be an urban adventure. 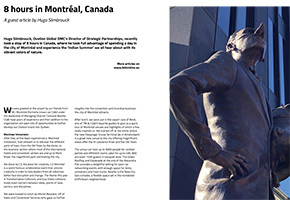 Hugo Slimbrouck, Ovation Global DMC’s Director of Strategic Partnerships, recently took an eight hour stop in Canada. Instead of just spending it drinking beers at the airport, Hugo took full advantage of his time and spent the day in the city of Montréal where he very briefly experienced a beautiful Indian summer. Apparently, there’s a lot a person can do in eight hours. BBT Online was invited to attend VIPeace 2018. 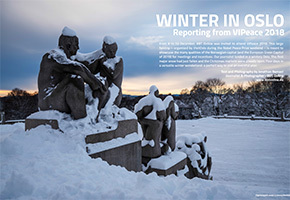 This famtrip – organised by VisitOslo during the Nobel Peace Prize weekend – is meant to showcase the many qualities of the Norwegian capital for meetings and incentives. Our journalist Jonathan landed in a snowy but sunny Oslo that was already getting into the Christmas spirit. Four days in a versatile winter wonderland: the perfect way to end a fantastic 2018. 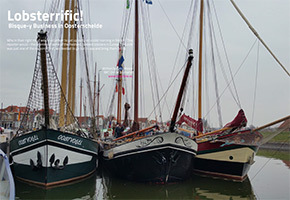 BBT Online was invited for a famtrip to the Dutch region of Zeeland recently. This meant long white beaches without any high-rises or mass tourism, cosy cities like Middelburg, Goes and Veere and interesting incentive activities like golf, cycling and even prison breaks. Guest writing for us is Alain Heggerick, from Rufie Events. Zeeland Meetings & Events will be presenton our B2B Workshop on 3 December. They will tell you everything you need to know about the destination. 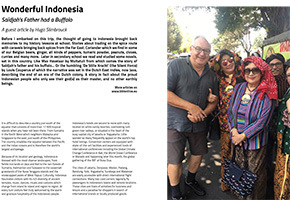 Our perpetually travelling friend Hugo Slimbrouck (Ovation Global DMC) took off to the beautiful nation of Indonesia this time. As a country consisting of more than 17.500 tropical islands, with incredibly varied landscapes, cultures and biodiversity, it is quite hard to describe to someone who has never been there. Hugo did his best though, and discovered all the best venues in and around Jakarta before eventually ending up on a Bali beach. Every year Meeting in Brugge -? 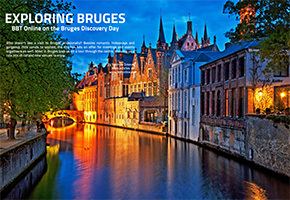 The Bruges Convention Bureau -? invites a group of meeting planners and BBT Online for a visit of the city to check out the latest developments on the MICE market. 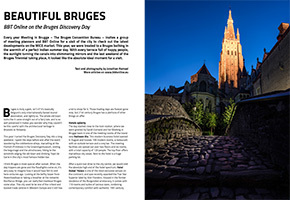 This year, we were treated to a Bruges bathing in the warmth of a perfect Indian summer day. With every terrace full of happy people, the sunlight turning the canals into shimmering mirrors and the last weekend of the Bruges Triennial taking place, it looked like the absolute ideal moment for a visit. 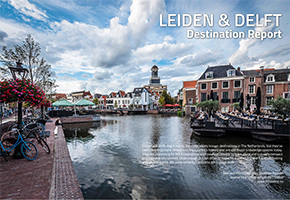 Leiden and Delft might not be the most widely known destinations in The Netherlands, but they?ve been very important throughout the country?s history and are still major knowledge centrestoday. They are interesting for MICE planners as well: easily accessible by train, plane and bus, very compact and walkable city centres, close enough to each other to make for a 2-in-1 trip and full of interesting venues and sights. The most northern country of Western Europe is beautiful, a safe place and populated by the happiest people. 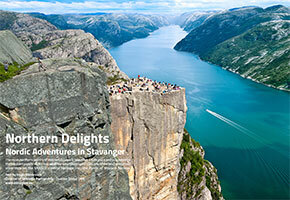 And it has what National Geographic calls one of the best-preserved attractions on the UNESCO?s World Heritage List: the Fjords of Western Norway. 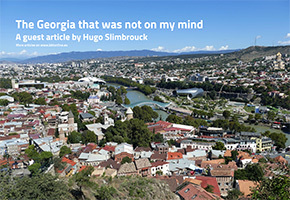 Hugo Slimbrouck and BBT Online?s publisher Karin de Graauw went on a fam trip to investigate. 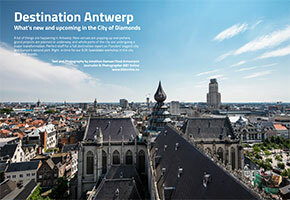 Flanders biggest city is going through so many changes some parts of it will be unrecognisable in the years to come. Venues are popping up, major projects are underway or being planned and old infrastructure is being repurposed. BBT Online was part of a study trip organised by the Switzerland Convention & Incentive Bureau and its partners. It was organised from 24 to 26 March and took us to the beautiful city of Lucerne and the region surrounding it. We would discover the many assets of the city itself, but would also venture into the mountains to discover a completely car-free winter sport destination. Writing the article is Rufie Events' Alain Heggerick. 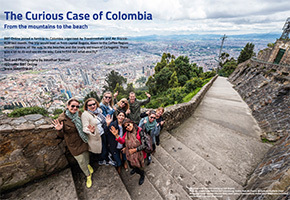 Ovation Global DMC's Hugo Slimbrouck took part in a famtrip to Colombia recently, taking him from the trendy and bustling capital of Bogota, to the colonial old town of Cartagena and the tropical Rosario Islands. 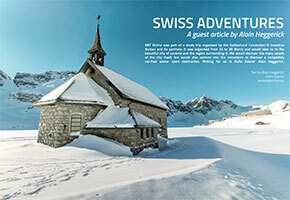 If you're looking for a surprising destination for your next trip, read all about his adventures. ANA-All Nippon Airways and BBT Online took nine Belgian MICE agents on a four day joint venture famtrip to Japan last February. 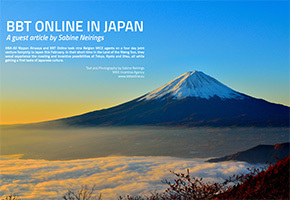 In their short time in the land of the rising sun, they would discover the various MICE possibilities of Tokyo, Kyoto and Otsu, all while getting a first taste of Japanese culture. Our reporter Jonathan once again took off to Shanghai, China last month, to attend the 2018 edition of IT&CM China, the most important MICE tradeshow in the country. He'll tell you all about what's new in Shanghai and the Asia-Pacific market in general. He'll also tell you how to join him as a MICE buyer on next year's edition. Hugo Slimbrouck (Ovation Global DMC) took a famtrip to the Latvian capital Riga. He came back with a myriad of stories and interesting things to discover and wanted to share them with us. 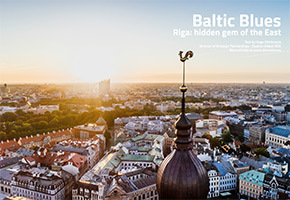 The Baltic States are some of the lesser known EU members, but boast some amazing destinations. Riga is a treasure trove of Art Nouveau architecture, and perfectly blends tradition with cutting edge cool. 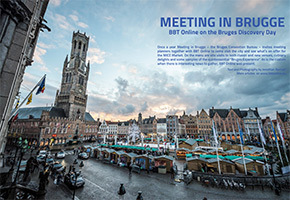 Once a year Meeting in Brugge – the Bruges Convention Bureau – invites a group of meeting and event planners and press to come visit the city and see what’s on offer for the MICE Market. On the menu are site visits to both classic and new venues, culinary delights and some samples of the quintessential "Bruges Experience". As always when there is something interesting going on: BBT Online was present. 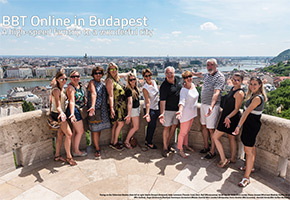 BBT Online travelled to Hungary for a famtrip in beautiful Budapest. The trip was organised by Ovation Global DMC, The Ritz-Carlton Hotel Company, Microcosmos DMC Budapest and SN Brussels Airlines. We would be in the Hungarian capital for less than three full days, which meant we would spend our time wisely and experience a wide array of locations and activities as efficiently as humanly possible. It turned out to be a lot of fun. Our reporter Jonathan joined a small group of journalists on a week-long press trip through lovely Jamaica. The island would soon reveal itself to be far more than the somewhat cliché image of a beach destination full of dreadlocks and reggae. 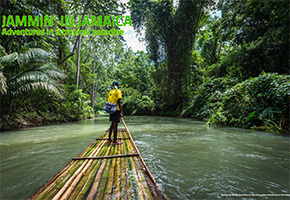 Jamaica is diverse, intensely beautiful and exciting, and you抮e about to discover why. 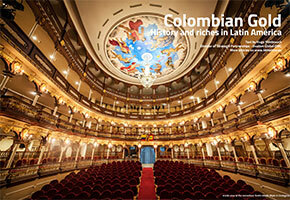 BBT Online joined an educational trip to Colombia organised by Travelmediate and Air France- KLM. The trip would lead us from capital Bogota, down to the Coffee Region around Pereira, all the way to the beaches and the lovely old town of Cartagena. There was a lot to do and see on the way. Care to know all about it? In a joint venture with BBT Online, Switzerland Convention & Incentive Bureau organised a famtrip for Belgian incentive organisers. 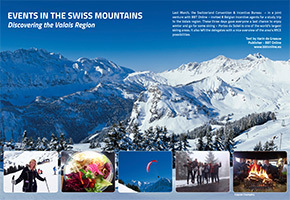 Destinations to be visited were the city of Geneva and the Valais region. The three day trip would give the group of six meeting and incentive planners the chance to discoversome of the region’s most interesting venues and activities. Testing the slopes was of course encouraged as well. Our reporter Jonathan took off to a surprisingly chilly Shanghai, to attend the 11th edition of IT&CM China - the country’s most important trade show for the MICE market. 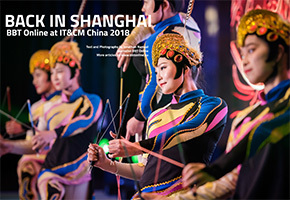 It came with a lot of new exhibitors, a lot of info on the growth of the Chinese meetings industry and two interesting pre-show tours revisiting some of the city’s most exciting venues. BBT Online took a twelve day trip through India. 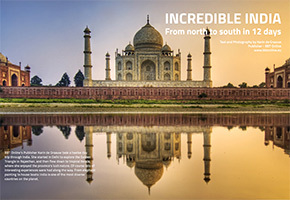 We started in Delhi to explore Rajasthan’s Golden Triangle, and then flew down to tropical Kerala, where she enjoyed the province’s lush nature. Of course lots of interesting experiences were had along the way. From elephant painting to house boats: India is one of the most diverse countries on the planet. 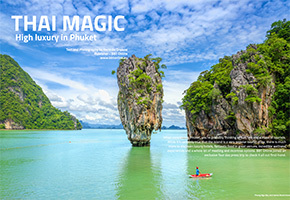 When considering Phuket, you probably think of sun, sea and a mass of tourists. While it’s certainly true that the island is a very popular tourist draw, there is much more to discover: luxury hotels, fantastic food in great venues, incredible wellness experiences and a whole lot of meeting and incentive options. BBT Online joined on invitation by Thai Airways International an exclusive four day press trip to check it all out first-hand. Meeting in Brugge held a well-organized 'Discover Bruges Day' for Belgian meeting and event organizers on 13 December, offering a nice mix of new venues and good old classics. Since it?s always a good time to revisit Bruges, we were more than happy to come along. Join us on the tour. BBT Online's friend Gilles Devos – Director of Sales at The Dominican, Brussels – fulfilled a lifelong dream this summer. 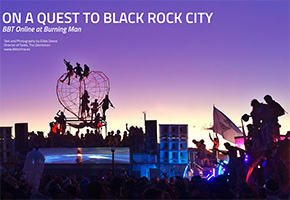 Together with colleague/friend Roelof Meijering, he travelled all the way to the Nevada desert to indulge himself in the madness, the heat and unbelievable creativity & brotherhood that is Burning Man. BBT Online sponsored a part of the trip and asked Gilles for a full report. We wanted to make our 10th B2B workshop into something special. 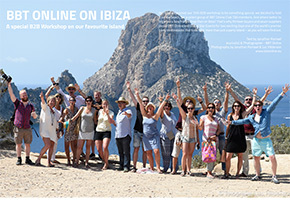 That’s why we took 13 buyers (all BBT Online Club 100 member of course) and 7 suppliers – to Ibiza for a workshop on the beach. Most people only think of the island as a party destination, but it’s so much more. 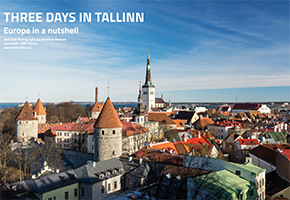 Just as the Baltic Winter passed into Spring, it was time for BBT Online to find out some of the many delights the Estonian capital, Tallinn has to offer. Colin Moors went to dis- cover the magic for himself, with the aid of the Tallinn-ted Team Estonia. Who in their right mind would volunteer to get up early on a cold morning in March? Our reporter Colin did - the promise of some of the freshest, tastiest lobsters in Europe for lunch was just one of the reasons. First, we needed to go out to sea and bring them home. 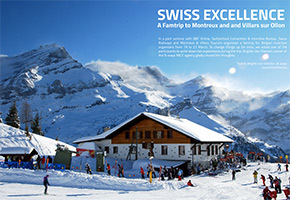 In a joint venture with BBT Online, Switzerland Convention & Incentive Bureau, Swiss Railways and Montreux & Villars sur Ollon Tourism organised a educational trip for Belgian incentive organisersfrom 19 to 21 March. Little did we know that the next day, March 22nd 2016, our world would change for ever. We enjoyed our stay: fantastic sunny weather, great food, lots of interesting venues - opening of Chaplin's world - and of course, some time for skiing. Nottingham turned out be a surprising destination. We ate in the coolest bar/restaurant ever: in an actual church. Not like the Jane for example, but just super cosy. We saw cool boutique hotels, great restaurants and the events were created around the Legend of Robin Hood. Nottingham is a lively, young city, a great city for incentives on a budget. 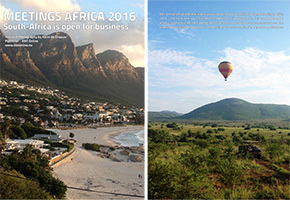 BBT Online's Publisher Karin de Graauw travelled to mesmerising South Africa to attend Meetings Africa 2016 in Sandron, close to Johannesburg. She met lots of interesting people, got to go on a post tour to lovely Cape Town but was certainly impressed by two things: the care and professionalism of the South African Convention Bureau and organisers and the vast possibilities of Johannesburg ? often overlooked for more popular destinations like Cape Town, Durban and the big game reserves. Our reporter Jonathan took off to Manila, to attend the ASEAN Tourism Forum 2016. 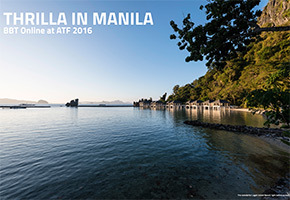 ATF is a trade show focused on the ten members of the Association of Southeast Asian Nations. Every year it is held in another member state. Because the lovely Philippines hosted this year’s fair, BBT Online did not only attend the event, but went on a simply marvellous post tour to El Nido and the Bacuit archipelago as well: one of the most magical places we've ever visited. 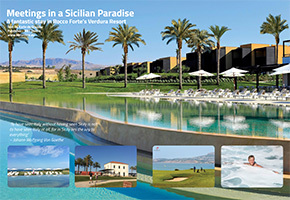 BBT Online & friends spent a couple of days in the beautiful Rocco Forte Verdure Resort on the Southwest coast of Sicilly this summer, located on a lovely domain between the Valley of the Temples in Agregento and the fisherman city of Sciacca. We had a great stay and came back completely refreshed thanks to the different spa treatments. Check out our experiences and pictures. 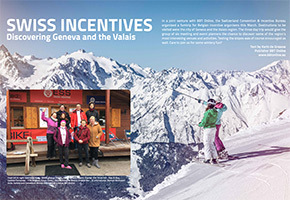 Last March, the Switzerland Convention & Incentive Bureau – in a joint venture with BBT Online – invited 8 Belgian incentive agents for a study trip to the Valais region. These three days gave everyone a last chance to enjoy winter and go for some skiing – Portes du Soleil is one of the world’s largest skiing areas. It also left the delegates with a nice overview of the area’s MICE possibilities. MCI’s Hugo Slimbrouck asked BBT Online to be the media partner and to find a suitable group of planners with potential for a famtrip to Moscow last month. It would be a short but intense visit, organised together with Ovation Global DMC, its local partner Galakti- ka, Brussels Airlines and Ritz-Carlton. We would get a first impression of what Moscow has to offer as a meeting & incentive destination, take a look at some of its most prized and surprising venues and of course enjoy the local cuisine and hospitality. It only took a couple of hours to convince the delegates of the city’s MICE value. In June 2015, fifty tourism industry decision makers gathered on the beautiful Ile de la Réunion in the Indian Ocean to attend the 10th edition of the NetM@nagers Conference. Among them was our newest team member Frank De Neef. NetM@nagers is a French association for online business travel experts. The event was organised by Eventiz, an event agency specialised in tourism and new technologies. Theme of the conference was ‘The Next Big Things’: knowing what everybody will be doing and using tomorrow, today. 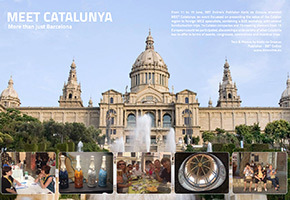 In June 2015, BBT Online’s Publisher Karin de Graauw attended MEET Catalunya: an event focussed on presenting the value of the Catalan region to foreign MICE specialists, combining a B2B workshop with several familiarisation trips. 74 Catalan companies and 73 meeting planners from 15 European countries participated, discovering a wide variety of what Catalonia has to offer in terms of events, congresses, conferences and incentive trips. When BBT Online’s Publisher Karin de Graauw posted her personal bucket list in our Take5 newsletter last year, she had no idea one of her five picks would already get realised just 6 months later. 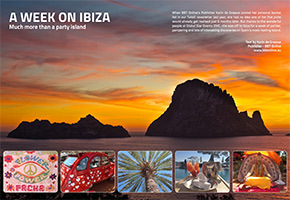 But thanks to the wonderful people at Global Star Events DMC, she was off to Ibiza for a week of parties, pampering and lots of interesting discoveries on Spain’s most riveting island. In April 2015, BBT Online stayed in the beautiful French Provence for a famtrip organised by Dolce Frégate Provence. 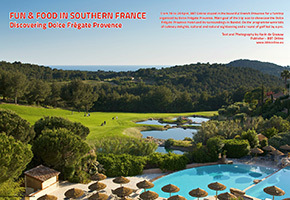 Main goal of the trip was to showcase the Dolce Frégate Provence Hotel and its surroundings in Bandol. On the programme were lots of culinary delights, cultural and natural sightseeing and a round of golf led by a pro. After attending Meetings Africa, Jonathan took a post tour to the impressive coastal city of Durban. 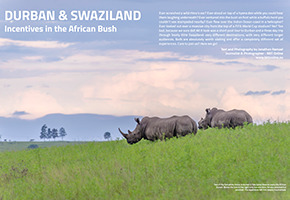 After that, he visited Swaziland and explored its wonderful national parks. He touched a wild rhino, stood on top of a hyena den, flew over Durban in a helicopter and took a walk in the bush while cape buffalos stampeded around him. 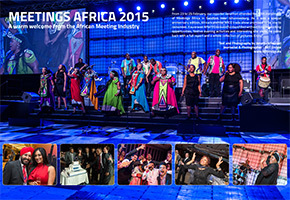 From 23 to 25 February, BBT Online attended the 10th instalment of Meetings Africa in Sandton, Johannesburg. As it was a special anniversary edition, Africa’s premier MICE trade show promised to be one to remember. It sure was! After three eventful days filled with exciting networking opportunities, festive evening activities and interesting site visits, we came back with a full report and a whole collection of pictures. Enjoy! 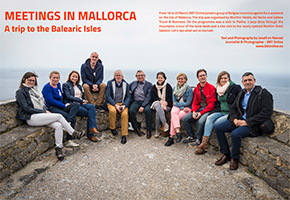 BBT Online joined a group of Belgian incentive agents for a weekend on the Isle of Mallorca. The trip was organised by Maritim Hotels, Air Berlin and Galben Travel & Business. On the programme was a visit to Palma, a jeep-drive through the mountains, a tour of the wine lands and a site visit to the newly opened Maritim Hotel Galatzo. 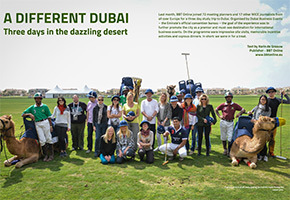 BBT Online joined 72 meeting planners and 17 other MICE journalists from all over Europe for a three day study trip to Dubai. Organised by Dubai Business Events – the Emirate’s official convention bureau – the goal of the experience was to further promote the city as a premier and must-see destination for international business events. On the programme were impressive site visits, memorable incentive activities and copious dinners. In short: we were in for a treat. The Estonian capital is probably the most visited city of the Baltics. Its close proximity to Helsinki and its marvellous medieval old town do wonders for tourism. Is it an interesting and versatile MICE destination as well? Three days of site visits, walks, excursions and dinners should make things clear. BBT Online joined several Belgian incentive houses for a 5-day trip to Panama – the small tropical country home to the world famous canal linking the Atlantic with the Pacific Ocean as well as North with South America. It proved to be a surprising and unbelievably varied trip. 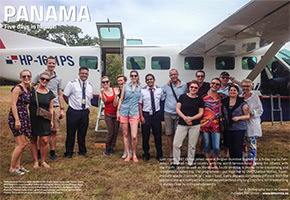 The programme – put together by DMC Quetzal Motivo, Travelmediate and Air France/KLM – was a treat. Every day was completely different from the previous one and every activity could happen without any long transfers, since everything is always close by in this small country. After taking part in trips to Krakow and Wroclaw, BBT Online was invited by the Poznan Convention Bureau, the Poland Tourist Organisation and the Poland Convention Bureau to travel to the city of Poznan in the heart of Poland. From cosy winter sceneries, local food, wines and ice sculptures to modern meeting facilities and innovative event concepts: Poznan has it all. 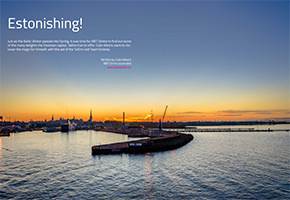 MINDevent introduced us to the value of Copenhagen as a meeting destination. But the Danish capital is much more than a conference city. It’s lively, trendy and often surprising. We decided to stay a bit longer and take the grand tour. Guiding us was Enerjy Aps, an independent DMC based in the city centre. 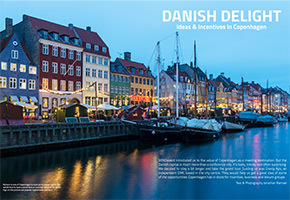 They would help us get a good idea of some of the opportunities Copenhagen has in store for incentive, business and leisure groups. The Estoril Coast is a destination with more history than you’d imagine. 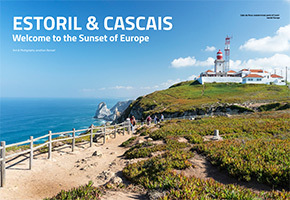 Just 20 km from Lisbon, it served as a summer retreat for the rich and famous since the 18th century. During the last world war its hotels were home to exiled royalty, high society members and officials, but also to countless spies documenting their every move. Years later it is still one of the country’s main leisure resorts. MICE is on the rise though, with several modern venues popping up in recent years. Most of all, the area offers lots of fun and interesting things to do.